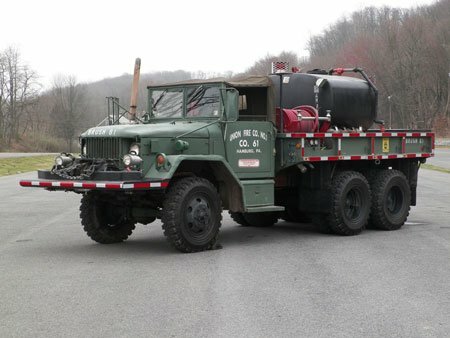 Brush 61, also known as 61-5, is a1965 US Army 2 ½ ton truck. The army rebuilt the truck in 1990. The unit was acquired by the department in 1997 and was converted to fire service use. The unit was equipped with a 250-gpm pump and 600-gallon tank. The truck also carries 400 feet of booster hose, 200 feet of 1½” hose, 150 feet of 2½” hose, 500 gallons of foam and various hand tools. The truck also carries a stokes basket, which is used for mountain rescues along the Appalachian Trail.